Have you ever wanted to have your very own kimono? Take home a Kimono as a souvenir? Or maybe just look at beautiful Japanese fabrics? 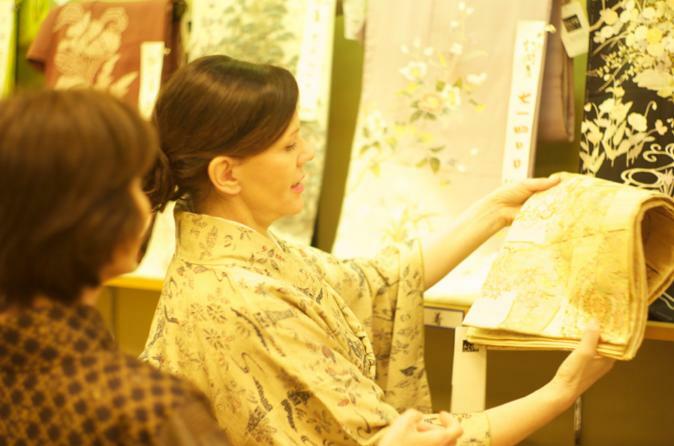 This tour gives you this opportunity to shop with your very own kimono expert who will take you around various recycled kimono stores where you can buy beautiful kimonos for men or women at a very affordable price. On this tour, you will be let in on the world of the geisha and be able to do some shopping for a complete and beautiful real kimono to wear yourself, buy some lovely silk dressing gowns, or even buy kimono pajamas. This tour may be run by Sayuki, the first westerner to become a geisha in Japan and own an independent geisha house, from time to time and by request, but will usually be run by Sayuki’s trainees. This is a way to let the prospective geishas practice their English skills and get some income during the crucial first year when they are training to become geisha. It also allows geisha to continue the beautiful geisha tradition in Japan.